You can tell a lot of things from the way someone walks. 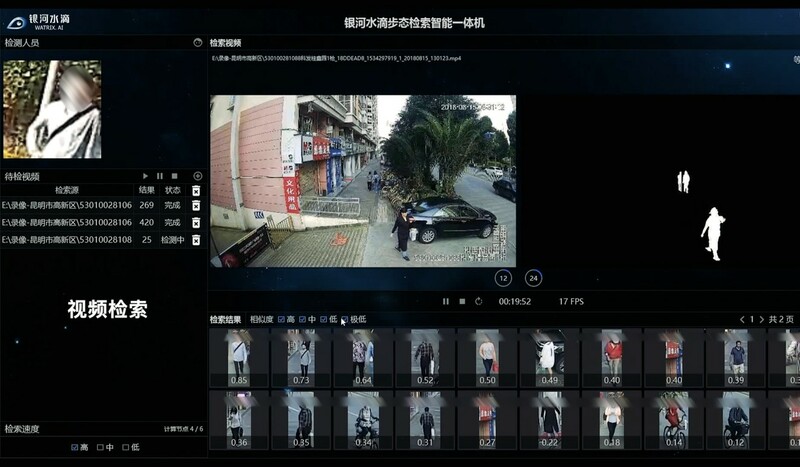 Chinese artificial intelligence start-up Watrix says its software can identify a person from 50 metres away – even if they have covered their face or have their back to a camera – making it more than a match for Sherlock Holmes. Known as gait recognition, the technology works by analysing thousands of metrics about a person’s walk, from body contour to the angle of arm movement to whether a person has a toe-in or toe-out gait, to then build a database. “With facial recognition people need to look into a camera – cooperation is not needed for them to be recognised [by our technology],” said Huang Yongzhen, co-founder and chief executive of Watrix, in an interview in Beijing. Features like this have given Watrix an edge in catching runaway criminals, who tend to avoid surveillance, said Huang. Police on the streets of Beijing, Shanghai and Chongqing, have already run trials of gait recognition technology, said Huang, and the company officially launched its 2.0 version last week, which supports analysis of real-time camera feeds at a mega-city level. Watrix is one of several Chinese start-ups, such as SenseTime and Megvii Inc, rolling out innovative applications of AI, which has been dubbed the fourth industrial revolution for the changes it is expected to bring to industry and society. Beijing is pushing facial recognition into many corners of peoples’ lives from exposing jaywalkers to saving toilet paper, from spotting ticket scalpers to enabling password-free payments. As trade and technology rivalry with the US ramps up, some scholars have argued it is China’s capacity to generate and mine vast data pools, aided by relatively lax privacy protection laws, that will give it an edge in AI. In his book AI Superpowers: China, Silicon Valley and the New World Order, Google’s former China head and CEO of technology-focused venture capital firm Sinovation Ventures, says that China’s entrepreneurs are using AI to solve real-world problems just like entrepreneurs in the 19th century applied the invention of electricity to practical concerns such as cooking, lighting and the powering of industrial equipment. China’s State Council in July 2017 unveiled its “Next Generation Artificial Intelligence Development Plan” for the country – a three-step road map for AI dominance by 2030. Not to be outdone, US President Donald Trump this month issued an executive order to maintain “American leadership in AI” aimed at prioritising investment in research and development in the field. An Oxford University report from 2018 found that except for “access to data”, China trails the US in three core areas of AI growth: hardware, research and algorithm development, and commercialisation of the industry. Rolling down his spectacles, Huang recalled the origins of his gait technology interest. Although the research behind gait technology was incubated under the Chinese Academy of Sciences it was first inspired by a US Defence Advanced Research Projects Agency (DARPA) study initiated in the 2000s, said Huang. “DARPA is like a wind vane in technology. Whatever projects it works on serve both social and national interests,” said Huang. Huang is a former CAS researcher who left academia in 2016 to co-found Watrix. Trying to outsmart the technology would test even the most creative criminals. Disguises and fake limping will not fool it. “Covering your legs would reduce the recognition score but we analyse all of a person’s body [when evaluating walking style],” said Huang. Huang says he has received dozens of enquiries about the technology since Watrix launched the first version of its software in October last year. The start-up is currently in talks with security companies from Singapore, India, Russia, the Netherlands and Czech Republic for contracts, where gait recognition can be used alongside face-scanning for real time or offline video-analysis solutions. Watrix also provides facial recognition technology and combining the two technologies can improve overall results. Beyond surveillance, gait recognition can also be used in smart homes, in nursing homes to alert staff when elderly people have fallen over or are about to, in hospitals for diagnosis of neural issues, and in physiotherapy as well as sports training, according to Huang. The company closed a 100 million yuan (US$15 million) pre-A funding round in October, and is planning to raise another 200 to 300 million yuan in its latest round to accelerate research and business adoption of the technology. “To me, it’s a cool technology and is beneficial to society and humans,” said Huang. However, when asked whether the technology could one day become a deterrent to crime on a large-scale, Huang struck a more cautious tone.